Just as my two great desires come head to head—that of seeing the world and that of staying safe and hidden at home, just as these competing needs threaten to derail me, I grasp this book in my hands. This book that, for me, illuminates so many of my own spiritual questions. This book that I had never heard of before and never would have picked up had I not been researching India. This great book with its incomprehensible name and seemingly impenetrable content. This book of that. So, what is it? 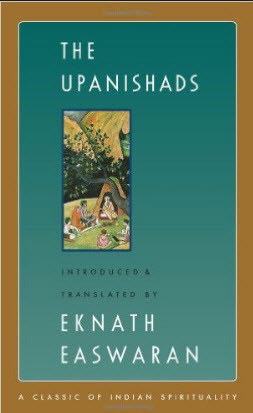 What are the Upanishads? So, as you can see, there’s a lot there. And yet, these “lessons” are written in parable form and as thought experiments, and because they address the reader directly, they are easy to read. The message may be big, but they in and of themselves are not intimidating. Please forgive me, because I may not get this entirely right. My impressions were as follows. The main idea is that all life is one. My life and your life and the dog’s life and the bird’s life, this thing that we call life is a unified thing. To us it appears separate and distinct. Most of us perceive life only through our senses of the physical world, and because of this, we think each thing has its own individual life. We don’t see life as a single entity, which according to the Upanishads, it is. But, say the teachings, don’t take it from us. You must go and find this out yourself, and this is how you can do it. You can experience firsthand what life truly is by exploring the four states of consciousness: waking, dreaming, dreamless sleep, and a higher state of consciousness that is indescribable—you can only know it by experiencing it through meditation. The Upanishads teach that the “Self” is not the body, but instead the “Self” is “Life” and “Life” is eternal. I got the feeling that when talking about God and gods, we are in the difficult area of semantics. Since I’m coming to this work from the Christian tradition, I started noticing similarities between this text and what I’ve been taught about God in the Western world. The two traditions do not necessarily negate each other, but instead work to reinforce an idea or description of the Divine. And finally, the “Self” is divine. Divinity runs through everything alive. Inseparable, live on the selfsame tree. The other looks on without eating. I think overall this is a call to adventure, a call to experience, and an idea of what you might find if you look inward. Ultimately, it tells us that we do not need to fear for we are all divine. But, we will remain blind to our own divinity if we don’t seek to experience the oneness of life through meditation, self-sacrifice, living righteously, controlling the senses, and stilling the mind. Oh, and this is a dangerous journey and you’ll need a teacher who has done this before.